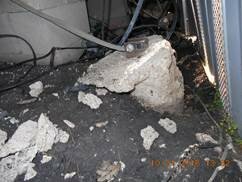 (1) Our inspector took this inspection photo of a non-compliant anchor. notice that there is no concrete around the anchor stem or head. 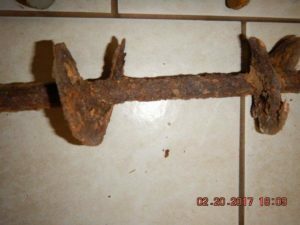 (1a) This is an inspection photo of anchor stems used to anchor the mobile home to the ground. 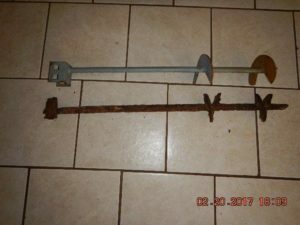 Both anchors are 31 inches in length. 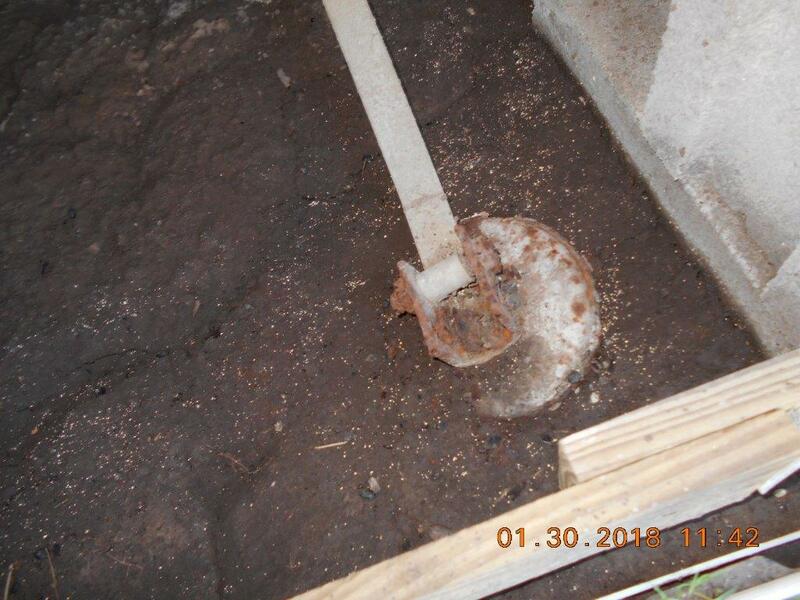 The bottom anchor had been in ground less than 4 years with no concrete collar and already was severely corroded. The top anchor is what the bottom anchor originally would have looked like. 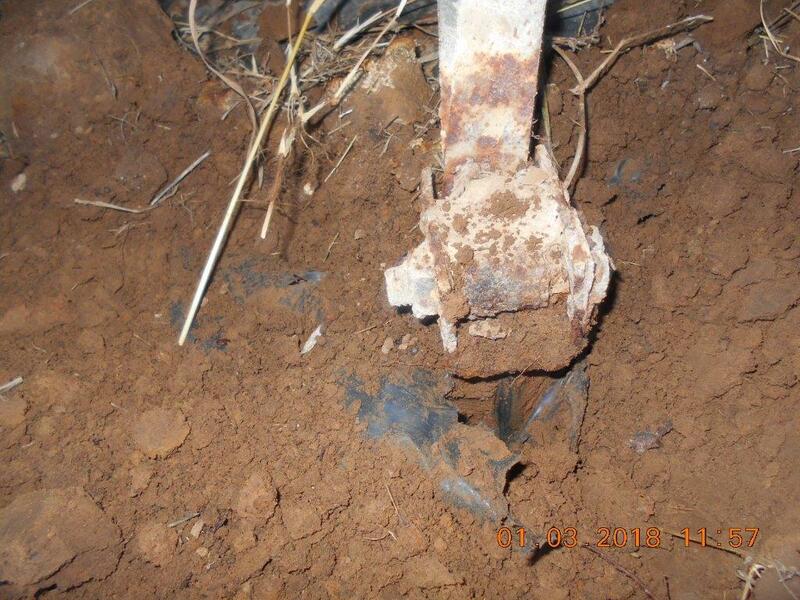 (1b) Close-up inspection photo of the anchor that had been in ground less than 4 years with no concrete collar and already severely corroded. 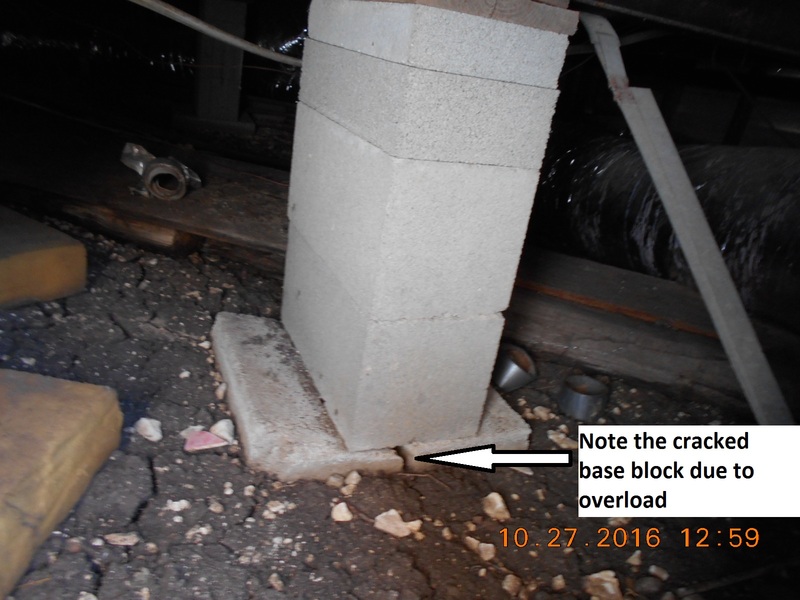 (2) Our inspector took this inspection photo of an FHA/HUD compliant anchor… notice that the anchor stem and head is set in concrete. 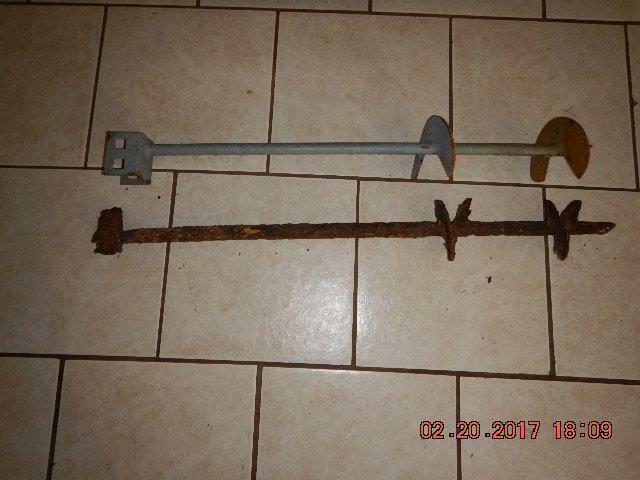 (2a) The above photo by our inspector shows a severely corroded anchor head as well as the beginning corrosion of the galvanized strap attached to it. 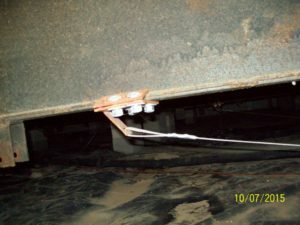 This strap would likely break in the very near future if not replaced with a new system. (2b) This is an example of an anchor with a bell plate that is supposed to add pull resistance. Both are obviously heavily corroded and no longer functional. (3) Our inspector took this photo of a corrosion-resistant galvanized anchor that started to be used in 2012/2013 by some installers. It is corrosion resistant and thus meets FHA/VA/USDA/HUD as well as Texas TDHCA Guidelines. 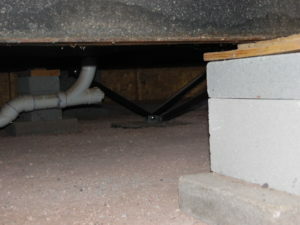 The skirting bracing is also set properly. (4) Properly installed longitudinal anchor. 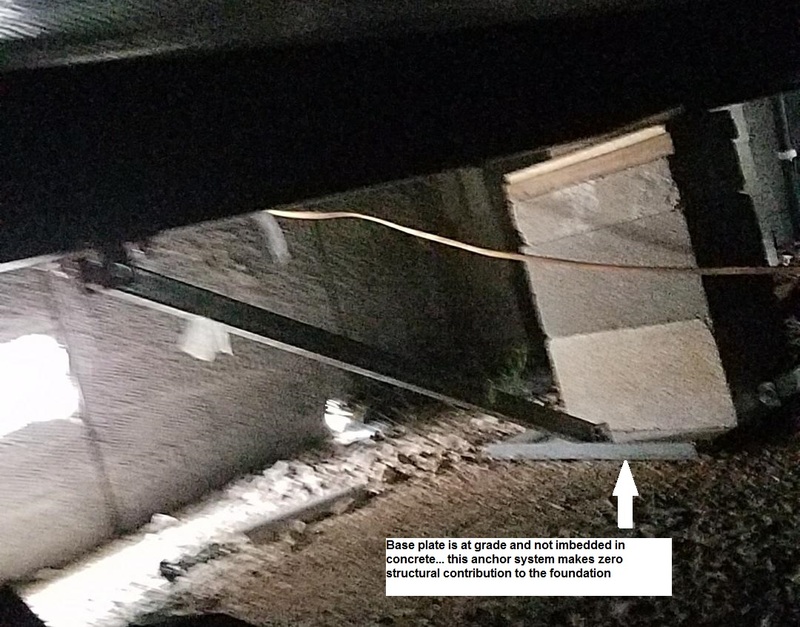 The anchor stem is embedded in concrete (the same longitudinal concrete runner on which the cinderblock pier is set ), the strap is at a reasonable angle and secured to the frame properly. (6) Another recent example of both a transverse and a longitudinal anchor properly installed. Notice that both anchor stems are set in the concrete longitudinal runner. Note also that the transverse anchor has the strap running at an angle to the interior frame and not vertical to the exterior frame. 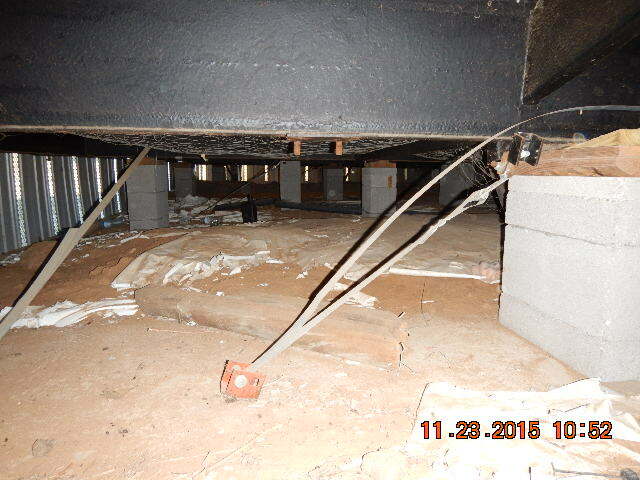 (7) Our inspector took this inspection photo as an sample close-up of how a longitudinal anchor strap is attached to the frame of the home. (7a) Sample Cross Vector Strap anchorage system. Our inspector took this inspection photo showing a sample Vector Cross Strap installation. It is an approved anchorage system if installed properly. 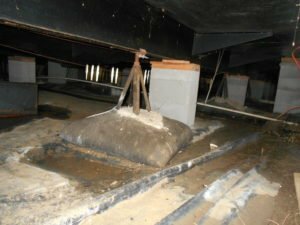 If the base plates are set in concrete to a minimum depth of 14 inches, it will pass. If there are a minimum of one cross vector unit per 16 feet along the marriage line, it will pass. 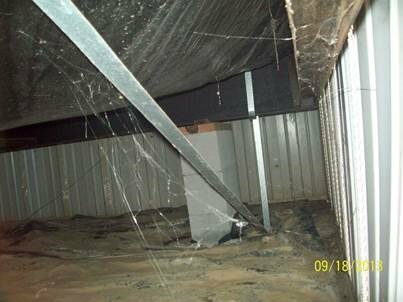 (7b) Our inspector took the above inspection photo of a anchoring system that does meet FHA/VA/HUD and Texas TDHCA guidelines if installed properly. 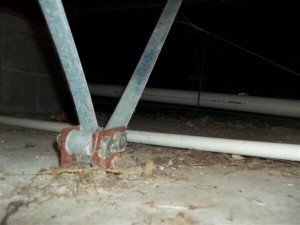 It would also be preferable if the mild steel shown in this photo were coated with a corrosion resistant paint to inhibit rust and extend the life of the system. (8) This type foundation is variously called a Magnum or Bigfoot Manufactured Home Foundation Pier. 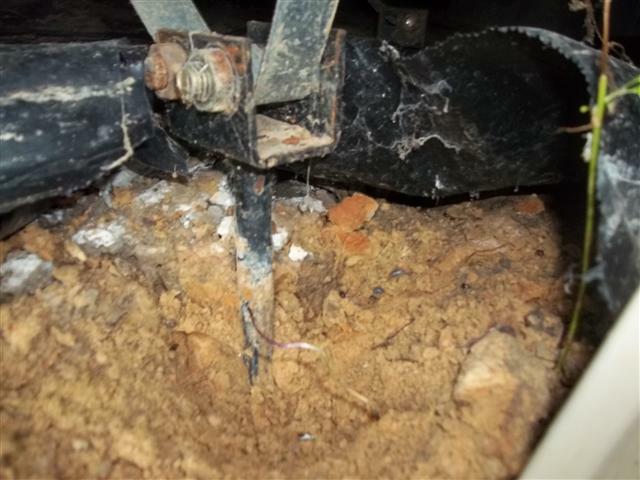 If the base plate is secured to a concrete footing that goes down at least 12 inches into the ground, it will pass. However, there are many cases, such as the one in the photo above, where the base is simply setting on the ground and does not pass. In addition, this pier must be set at all four corners of the home, at a minimum, in order to pass. 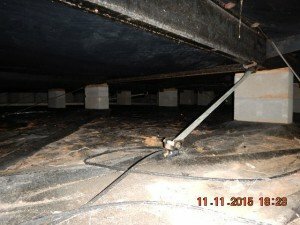 (8b) This inspection photo shows what can happen when a single pier is overloaded and near failure. The height of this pier should have required double-stacked cinder blocks and also a concrete footing under the pier to provide stability. (8c) Another example of an improperly installed BigFoot or equivalent system. 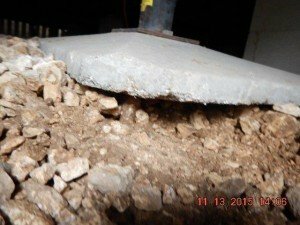 If the base plate had been embedded in a concrete footer extending a minimum of 8 inches below grade (preferable 12 inches ), it would have passed. 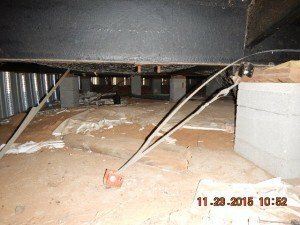 An example of why anchors and straps are critically important to your home. The tool shed at the top right corner, set on a proper foundation, that remained intact during the same wind storm.